Toyotathon is back for its 38th year with a 100-second holiday commercial, a first in the broadcast industry, that showcases a family’s multigenerational story. “R+S” premiered Tuesday night, November 28, on NBC during “The Voice” in an isolated pod, with no other advertising or promotional spots surrounding it. This 100-second spot comes at a time when most networks are reducing commercial time. “R+S” unfolds like a film as it tells a family’s multigenerational story using a much loved family tree as the centerpiece. The narrative starts with the grandparents as a young couple and the tree bears their initials, “R+S.” The story continues decades later after the tree has fallen from natural causes. During the holiday season the grandparents visit their daughter’s home to find a framed picture of themselves as a young couple in front of their special tree. As the rest of the family hides in anticipation, they see the inscription of their initials “R+S” on the table and quickly realize its their beloved tree. The spot features a real family of actors including grandparents, their daughter and her husband and children. The director, award-winning cinematographer, Lance Acord, filmed in central California and cast a family from the same area. “The story comes to life because it represents real families. The central point of the narrative, the tree, is also a metaphor for life and the underlying theme of a matriarch passing on the torch from one generation to the next,” said director Lance Acord. Acord directed the spot in a way that makes the viewer re-experience the holidays from another family’s lens and carries that emotion with them to their own family festivities. 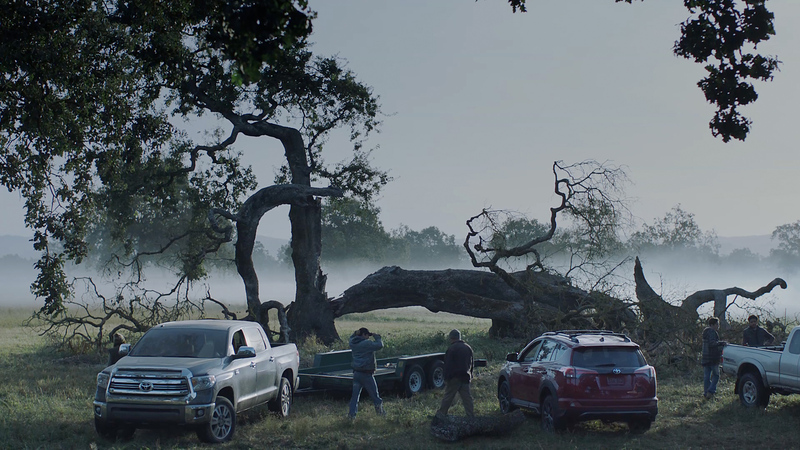 Fostering the true meaning of the holidays, togetherness, Toyota tugs at the viewer’s heartstrings by focusing on the family’s story to create a relatable, emotional experience during the hectic holiday season. “R+S” premiered on NBC with the special 100-second airing before moving to top theaters nationwide for in-cinema play in National CineMedia (NCM)’s Noovie pre-show on over 20,600 movie screens from December 1-28. A mix of :30 and :60 versions of “R+S” will air on television December 10-24. The Toyotathon December Sales Event offers incentives through January 2. View the “R+S” :100-second spot here.